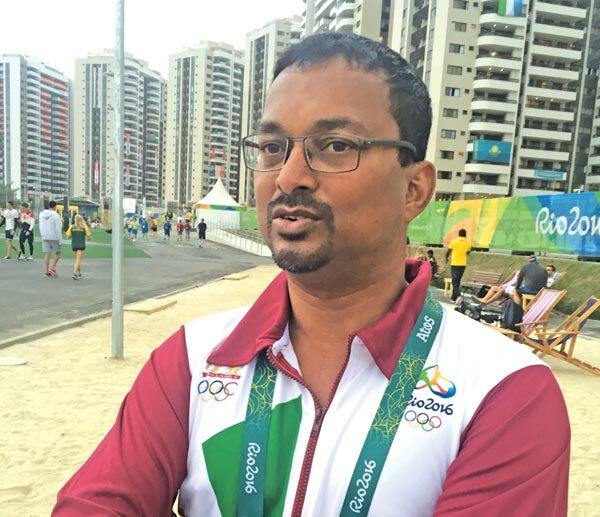 RIO DE JANEIRO, Monday: Veteran Sri Lanka coach Manoj Abeysinghe said swimmer Kimiko Raheem should not think that her disappointing performance in Rio 2016 Olympic Games is not the end of road for her and that the promising teenage swimmer has a long way to go in her sporting career. “She is only 17 years old and competing at the highest level such as the Olympics is a big experience. It is unfortunate that she could not come out with her true form and the reason for that could be best described by her coaches in Thailand as was trained by them for over a year there,” said Abeysinghe who has played a prominent role in Sri Lanka swimming, producing several top swimmers through his Killer Whales Aquatic Club. Five-time South Asian Games gold medallist, Raheem has been training in Thailand for over a year under a full FINA scholarship and came under the watchful eyes of Abeysinghe just weeks before the 2016 Olympics on her return to Colombo on completion of the stint in Phuket. “She has been training under me for about a month and has been shaping well. She was suffering from flu after her arrival here but recovered well in time for her event. However, she was not at her brilliant best in today’s heats. It was unfortunate that Kimiko could not show her true potential. But there is no need to push the panic button at this stage as she has enough time to shape well and strike right in future,” he said. Competing in the women’s 100m back stroke heat two, the Lankan lass, the youngest of three Raheem sisters painted a poor picture with a timing of one minute and 4.21 seconds. “It was disappointing. I was aiming to renew my Sri Lanka record but things did not go to my liking. But I will make use of this experience and prepare for the future. I will go back to Thailand as the British School there has offered me a scholarship to study and train. I will work harder and bounce back in near future,” a determined Raheem said. Sri Lanka’s other hope in swimming at Rio 2016 Games will be Matthew Abeysinghe who is down to compete in men’s 100m freestyle first round heats on Tuesday (9). Incidentally, Matthew is the younger son of coach Abeysinghe whose elder son Andrew had bagged two gold medals at 2006 South Asian Games. Matthew has fared even better than his elder brother, winning a record number of ten medals, including seven golds, at 2016 South Asian Games. Matthew Abeysinghe, who created history by becoming the first-ever Lankan swimmer to gain Olympic qualifying standards in Hong Kong last month, has been hard at training ever since his arrival here from the United States. Although his baggage was found to be missing on his arrival, he has now received it after it was found in Miami. “He has been putting a lot of effort during his training schedules. He is finding both the weather and pool conditions to his liking. He is looking forward to produce something special,” coach Abeysinghe said. Matthew too endorsed the views, hoping to continue his stunning form at the Hong Kong Age Group meet in Hong Kong last month. “My training schedules have been going on smoothly and I look forward to spring a surprise or two,” he said.